365 Days to "I Do"
Forget waiting for Mr. Right! You can go out and find "The One" yourself when you follow this plan. Celebrated relationship expert Dr. Janet Blair Page has distilled the very best of her acclaimed dating class at Emory Universitythe one covered by CNN, FOX, Good Morning America, and The Early Showinto this one-of-a-kind book. She's helped bring thousands of singles true loveand now it's your turn! The power is yoursand with Dr. Page's guidance, you'll use that power to meet and marry your Perfect Guy. 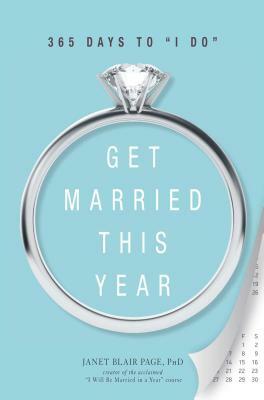 From designing the ultimate Spouse Shopping List to getting the right guy to commit, this tried-and-true method gives you the blueprint you need to take charge of your love life and find love that can last a lifetimein only 12 months or less! Janet Blair Page, PhD is a psychotherapist with more than thirty years of experience in private practice in New York and Atlanta. She teaches at Emory University and has been in the New York Times, Glamour, and on CNN, FOX, Good Morning America, and The Early Show.